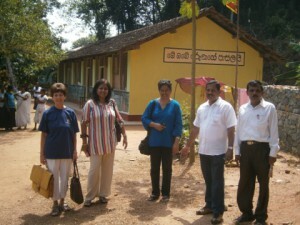 Project Sri Lanka was asked by the Rotary Club of Colombo Mid-City to finance the reconstruction of a primary school at Mapalagama, inland from the town of Galle. We have been delighted to support this project and have done so in partnership with the Rotary Club of Alnwick in Northumberland, UK and other Rotary Clubs in District 1030 in the north-east of England who have donated funds to this worthy cause. In addition to donations from individual Rotary Clubs towards building costs, a generous grant from District 1030 has provided furniture and equipment for the new school. Mapalagama once had a thriving primary school but sadly numbers dwindled because of its remoteness and the original building fell into disrepair and eventually collapsed. In recent years, a committed new Principal re-started a school in a nearby old building and successfully built up the number of pupils attending to around 40. This building was not fit for purpose and was furnished with dilapidated chairs and desks salvaged from another school that was closing. So Project Sri Lanka agreed to build a brand new school on the site of the original collapsed school and together with the Rotary Club of Alnwick and Rotary District 1030 has enabled this highly worthwhile project to come to fruition. It is anticipated that the number of children attending the school will rise to over 100 in the near future. 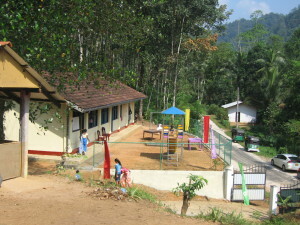 Following the successful completion of the junior school, Project Sri Lanka was asked to support a complete refurbishment of the pre-school on the Mapalagama site. This was completed in January 2015 when the pre-school was declared open. It is now a clean, bright, well-equipped school with a hygienic toilet block. Hopefully this improvement will enable many young children to come to school here and proceed to the primary school after the early years of learning. In 2015 a new Principal was appointed to the school who is very committed and enthusiastic about developments there and Trustees Joy and David Cooper had the pleasure of meeting him in 2016.